Note: This post has been updated to remove some inaccurate and misleading datasets regarding exits and follow-on funding. Last fall, I set out to answer a question that had been on my mind for most of 2017: In the venture capital world, do female-founded companies perform better than their male-founded counterparts? The goal was to close out the year with a comprehensive post examining whether private companies founded by women have better financial prospects than those founded by men. It would have been an ideal way to wrap up one of the major tech themes of 2017: women in VC. The topic was a constant presence in a year that included an explosive blog post from a former Uber engineer that contributed to Travis Kalanick's downfall, several male venture capital investors stepping down from positions of power after sexual harassment allegations, the Katrina Lake-led Stitch Fix IPO, and endless conversations and articles on getting serious about closing the gender-fueled funding gap. In March of last year, I produced a datagraphic showing that while VCs were investing in female-led companies more often than they had been 10 years ago, the numbers were still low. In 2016, roughly 17% of VC deals were for companies with at least one female founder—and if I had used data for companies with solely female founders, that number would have been much lower. In fact, PitchBook data shows that in 2017, just 2.2% of all venture capital in the US went to companies founded solely by women. The story is about the same when measured by deal count: Roughly 4.4% of VC transactions in the US last year were for female-founded companies. And the investor side isn't much more diverse: Just 11.3% of partners at VC firms in the US are female. After writing much more about female founders and speaking with many prominent women in the VC world, including Aileen Lee and Hayley Barna, I decided to take the topic to the next level. My plan was to bolster findings from other publications with additional data points from the PitchBook Platform. 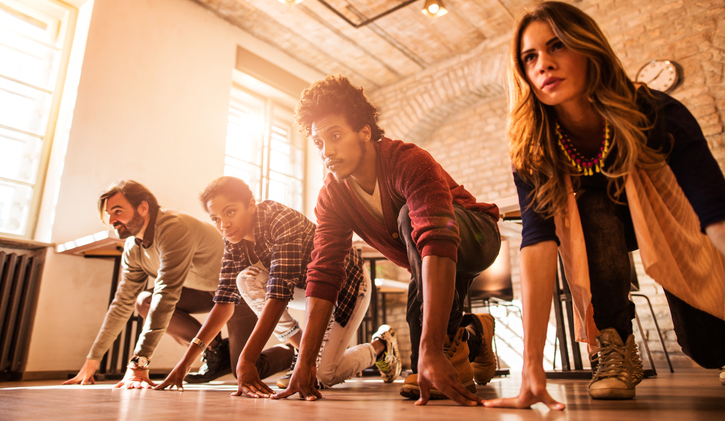 First Round Capital reported in 2015 that the female-founded companies in its portfolio outperformed male-founded companies by 63%, as measured by returns for investors. In September 2017, Harvard Business Review published an article called "The Comprehensive Case for Investing More VC Money in Women-Led Startups," which reported a finding from the Small Business Association that venture firms that invested in female-led businesses saw an improvement in their fund's performance. Those conclusions are encouraging for women in VC, but they don't provide information about whether more investors are actually backing more female-founded and female-led companies as the years go by. I figured PitchBook's data could supplement the findings of the articles mentioned above by providing a look at how female-founded companies in the US perform within the venture capital landscape. Based on those previous reports, I thought our data would support the claim that it's smart for venture investors to back businesses founded by women. Part of my job is staying on top of tech trends, and one of the biggest stories in the last year has been the male-centric culture in Silicon Valley, and, as a corollary, the stunningly low percentage of venture capital invested in female-founded companies. So as a woman in the tech industry with a front-row seat to the disparity in funding for men and women, I really wanted our data to support that claim. I'd envisioned an in-depth article with a headline like "Female-founded companies are worth more than their male-founded counterparts." But, as you may have noticed, that's not the headline of this post. I couldn't find evidence that female-founded companies perform better, at least not when measured with a VC yardstick. I'm frustrated I wasn't able to bring you the article of my dreams. But even though the conclusion isn't what I expected it to be, I'm going to share my efforts. Initially, I looked at valuation data for companies founded solely by women versus companies founded solely by men. I thought that if First Round Capital found that female-founded companies provided better returns, maybe they would also have higher valuations. 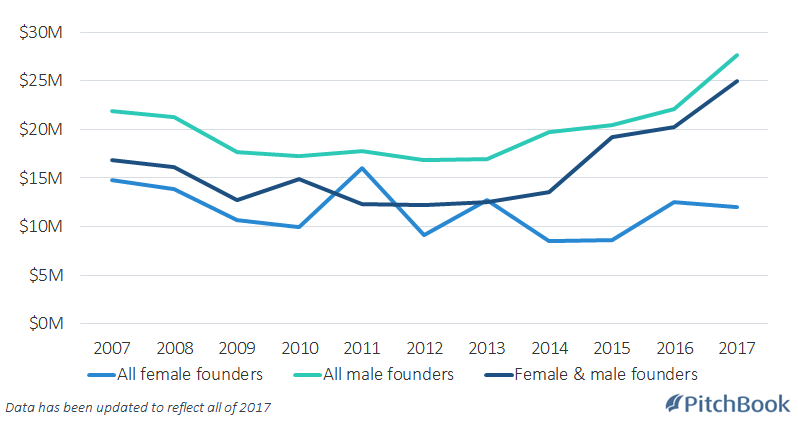 So I compared valuation numbers for US VC deals from 2007 to 2017 for companies founded by women and those founded by men, and threw in mixed-gender founding teams for good measure. What I wanted to find: A steady uptick in valuations and step-up valuations for female-founded companies over the last decade. 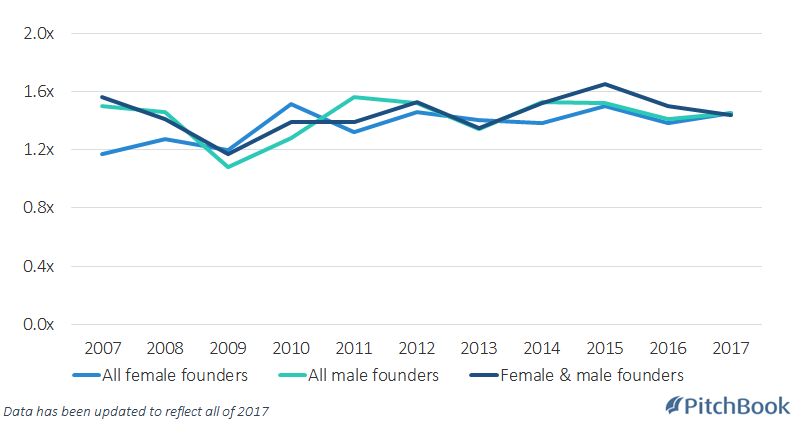 What I actually found: The median valuation for female-founded companies was lower in 2017 than it was in 2007. Meanwhile, the opposite holds true for male-founded companies. Companies founded solely by women have experienced a rise in step-up valuation over the last decade, but the increase is minimal. At this point, I considered writing a straightforward post about the findings. But I felt that would have been too repetitive, as the numbers are so similar across the board. I still wanted to present the information, though. I think it's important to show that even though there are so many conversations about why it's important to back more female-founded companies, there's still a major VC funding gap—and when I say "VC funding gap." Some of the numbers from earlier in this post bear repeating: Just 2% of all VC funding in the US goes to companies founded solely by women. Only 11% of partners at VC firms in the US are female. The tech world needs more female VC investors, more female-founded startups and more funding for women. Maybe more female VCs will lead to more funding for women, or maybe more funding for women will lead to more female-founded startups. Maybe both. I don't know exactly how the cycle is going to work, but one thing is clear: There's a lot of room for the numbers to go up. There is reason for hope, both according to the numbers and anecdotally. The percentage of VC deals and capital that goes to female-founded companies has risen over the last decade, and female founders and investors are becoming more and more vocal about closing the gender gap as the years go on. But there's a lot of work to be done. Read more of our content on women in the venture capital world.